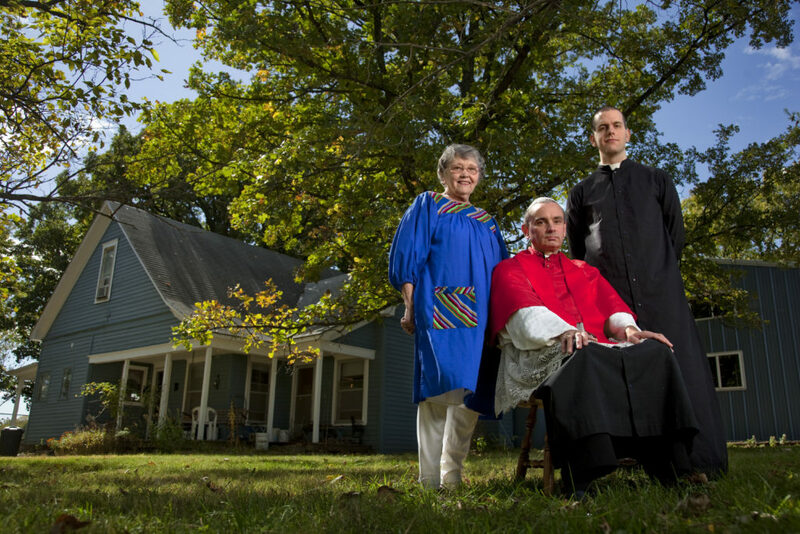 Pope Michael, also known as David Bawden, is pictured outside his farmhouse in Delia with his mother, Clara “Tickie” Bawden, and Phil Friedl, a seminarian living and studying with him. In 1990, six family members and followers elected Bawden pope of the Catholic faith after recognizing personal differences with Church doctrine. Tickie Bawden shows a photo of her son, David, as a child..
David Bawden and seminarian Phil Friedl walk the country road to the farmhouse. 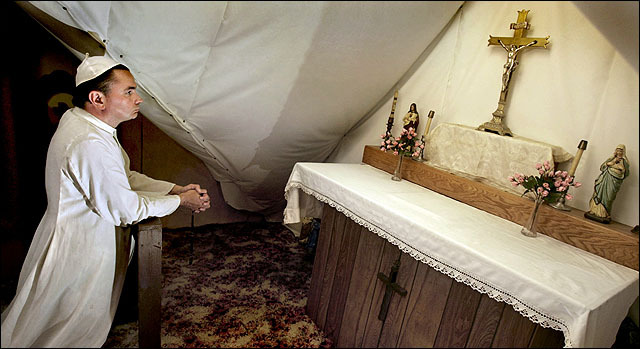 David Bawden, who has taken the name Pope Michael I, prays in a chapel in the attic of his home near Delia. Bawden has claimed to be the rightful leader of the Catholic Church since he was elected by a handful of traditionalist Catholics in 1990.
Who: Presentation by David Bawden, aka Pope Michael. Where: Big 12 Room, Kansas Union, Kansas University. The pope drives a pickup truck. Sometimes, a four-door Subaru. He likes his barbecue charcoaled-rare and smothered in sauce. Books are a passion — he has more than 6,000 — as is “Jeopardy!,” and he makes a mean spaghetti sauce. On Sunday, like every day, he prays in his in-house chapel, but not even his backing can bring his beloved Kansas City Chiefs a winning season. Of course, those games aren’t broadcast in Rome. But they do make their way to a small blue farmhouse on 5 acres decidedly closer: Delia, population 178, just northwest of Topeka. There, you’ll find Pope Michael I. Sitting on an antique couch with his mother by his side, he’ll tell you he’s the successor to Pope Pius XII. He believes the church known around the world as the Roman Catholic Church — called the “Novus Ordo” in his home — has been led by antipopes since Pius XII’s death in 1958. So, for the past two decades, Pope Michael, 50, has preached his brand of Catholicism from the family home he shares with his mother, Clara “Tickie” Bawden. Also making the Vatican home is a seminarian, 22-year-old Phil Friedl who was a toddler when Pope Michael, born David Bawden, was elected pope July 16, 1990, in Belvue by a group of six laypeople. If you haven’t heard of Pope Michael or his church, it’s not for his lack of trying. He runs his own Web site, www.vaticaninexile.com. He’s hosted a documentary film crew in his home for a forthcoming movie, and he tweets and replies to fans on Facebook. He plans to explain his views at 7 p.m. Monday at the Kansas Union’s Big 12 Room, where he’ll be a guest of Kansas University’s religious studies department. He knows he’ll get laughter and maybe strange looks because of his papal dress. But he doesn’t care because, as his mother says, this is serious business. The transition from David Bawden to Pope Michael began in elementary school, when the Second Vatican Council hit conservative Catholics such as the Bawdens like an atomic bomb. The reforms Vatican II was pushing in the early 1960s were and are something the family views as heresy. Not only did the council do away with the old-style Latin Mass, but it also allowed more latitude to other forms of religion as well as tweaked the wording in a crucial piece of doctrine. 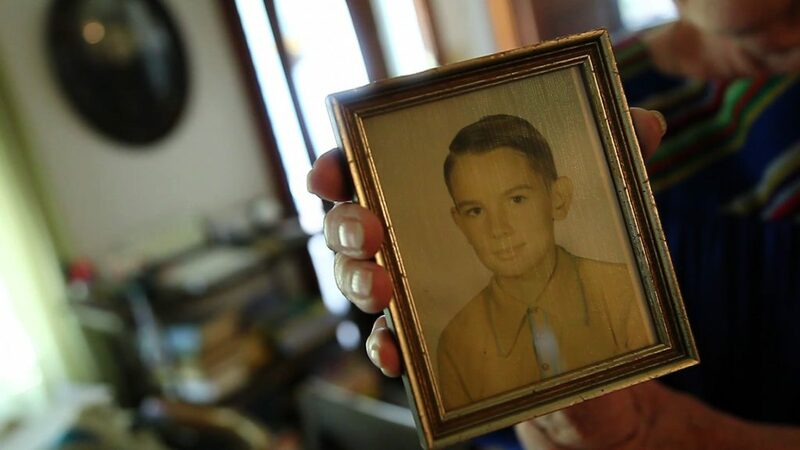 Among those outraged were Tickie and Kennett Bawden, who were raising their sons, David and Brian, in the Catholic faith in Oklahoma City. A devout family — Tickie’s sister even became a nun — the church’s attempt at change left them feeling in the cold. “If everyone is saved, then why be good?” Tickie Bawden says. Despite the dismissal, the family moved to St. Marys in the early 1980s to be closer to the society, and Pope Michael decided to take his religious education into his own hands. “I started just buying books, put myself in the hands of the Holy Ghost and just started studying,” he says. By the mid-1980s, the Bawdens, now broken off from the society, believed there should be a papal election and sought out others who felt the same way. On July 16, 1990, a group of six people — the Bawdens and three followers –in Belvue elected David Bawden to the papacy. The easiest part, it turned out, was taking the name Pope Michael, an homage to his religious hero and storied protector of the good, the archangel Michael. The hardest part came to him soon after. Going against such a powerful tide as the Roman Catholic Church is no easy task. Funding a church is hard to do when your estimated membership roll caps off at 50. The family keeps the church running solely on savings, donations and odd jobs the pope does from time to time. As part of his duties, Pope Michael maintains his own Web site — blogging, putting up video and sending out newsletters — builds his own computers and works on the interior of a seminary building attached to the farmhouse in 2000. Right now, Friedl is the only seminarian, but he is making it his goal to bring Pope Michael’s church to as many followers as possible once he is ordained. It’s a dream the former engineering student’s family in Chicago doesn’t understand. Frustrated for a different reason is Teresa Stanfill Benns, who is one who wishes David Bawden would just leave it alone. A former follower, she attended and promoted his election, even writing a book with him, “Will the Catholic Church Survive the Twentieth Century?” before election day. And what does Pope Michael say to his critics, including those who will surely show up on Monday night at KU? Not that he believes John Paul II would have gotten his tongue if the critic had actually succeeded — Pope Michael has been waiting for word from Rome ever since he sent John Paul II a letter of excommunication while he was alive. The circumstances that led David Bawden to be elected Pope Michael are complicated, but they began in the sedevacantist movement. The movement began after the death of Pope Pius XII in 1958. The next two popes, John XXIII and Paul VI, oversaw Vatican II, a council that instituted changes in the church, including what some say is an adjustment in how salvation is perceived. Because of these changes, groups began to break from the church, believing the differences were in error. These groups believed the papacy must be filled by an antipope because a true pope would not make such changes. The Bawdens say their point is proven by the church’s more recent problems, including the child molestation scandal and the shortage of candidates for the priesthood and women becoming nuns. But Carroll Macke, communications and planning director for the Archdiocese of Kansas City in Kansas, says whatever the disagreement, not just anyone can form a committee and elect a pope.